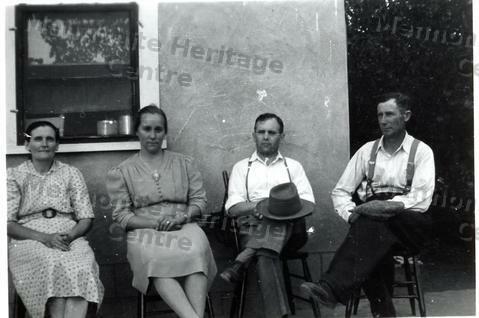 This is a photo of four people, (left to right): Mrs. Regier, Mary Koop, Peter Koop and Peter Regier, seated outside a building. The women are wearing neat [Sunday?] dresses and the men white shirts and suspenders. The home is of Peter Regier in Coaldale, AB.